Summary: Difference Between Enamel and Dentin is that enamel is the hardest tissue in the human body. It is the only ectodermal derivative of the tooth. Inorganic constituents account for 96% by weight and they are mainly calcium phosphate in the form of hydroxyapatite crystals. While dentin forms the bulk of the tooth. It consists of dentinal tubules, which contains the cytoplasmic process of the odontoblasts. The tubules are laid in the calcified matrix—the walls of the tubules are more calcified than the region between the tubules. The dentin forms the bulk of the tooth. It consists of dentinal tubules, which contains the cytoplasmic process of the odontoblasts. The tubules are laid in the calcified matrix—the walls of the tubules are more calcified than the region between the tubules. The apatite crystals in the matrix are plate like and shorter, when compared to enamel. The number of tubules near the pulp are broader and closer and they usually have a sinusoidal course, with branches, all along and at their terminus at the dentinoenamel or cementodentinal junction. The junction between enamel and dentin is scalloped to give mechanical retention to the enamel. Dentin is avascular. Nerves are present in the inner dentin only. Therefore, when dentin is exposed, by loss of enamel and stimulated, a pain-like sensation called sensitivity is experienced. The dentin forms throughout life without any stimulation or as a reaction to an irritant. 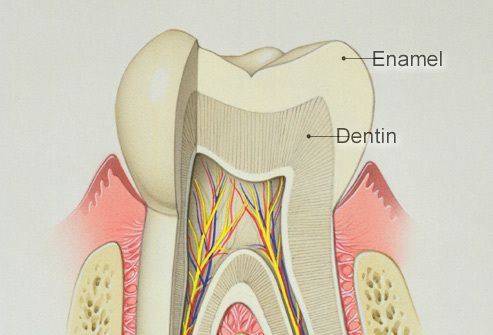 The cells that form the dentin—the odontoblast lies in the pulp, near its border with dentin. Thus, dentin protects the pulp and the pulp nourishes the dentin. Though dentin and pulp are different tissues they function as one unit.